Sicily has a unique character all its own. For more than 2000 years Sicily has been invaded and colonised by foreign powers. Its capital, Palermo, is nearer to Tunis than it is to Rome, although Sicily is an Italian island it maintains a thoroughly independent sense of identity. One of the largest islands in the Mediterranean, Sicily is a wild and beautiful place with a wealth of history and culture. Most people probably know Sicily for two things: Mount Etna and the Mafia. But there is so much more to a luxury yacht charter in Sicily than that, the Norman cathedral in Palermo, the beautifully preserved Greek temples at Agrigento and Selinunte, the baroque splendours of Noto, and the extraordinary Pantalica Necropolis, to name but a few things on any visitor’s must-see list. But Sicily does have its dark side, and centuries of oppressive foreign rule have made the Sicilians suspicious of government from beyond their shores. In the past they have relied on their own forms of justice, primarily meted out by Mafia Dons. The Mafia’s grip on the island has been loosened in the last few decades, but not entirely. Visitors however are unlikely to experience anything other than anti-Mafia graffiti. 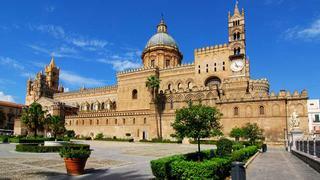 But for all its turbulent history, Sicily is a wonderful island inhabited by friendly and hospitable people. Their culture, cuisine, and customs are enchanting, and it’s hard not to fall in love with the place once you have spent a bit of time there. Whether you’re seeing the sights, eating incredible seafood in a harbour-front restaurant, while lying on a beautiful sandy beach with the crystal clear waters of the Med lapping at your toes, Sicily is a fabulous place to get away from it all. Taormina: A lovely town on the coast with great views of Mount Etna.